Col. Steven Behmer, U. S. Air Force Weapons School commandant, passes a guidon to Lt. Col. Douglas Medley, 32nd Weapons Squadron commander during an assumption of command ceremony at Nellis Air Force Base, Nev., June 28, 2018. The 32nd WPS will focus on the Cyber Warfare Operations Weapons Instructor Course taught at the Weapons School. 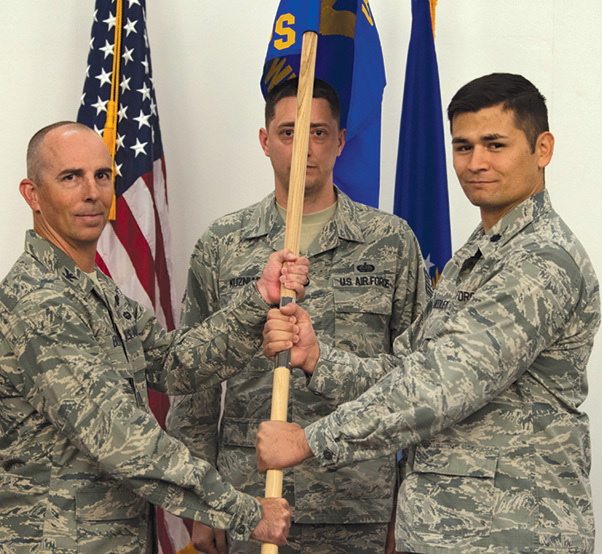 The 32nd Weapons Squadron activated June 28 at Nellis Air Force Base, Nev. The 32nd WPS will serve as the U.S. Air Force Weapons School’s Cyber Warfare Operations Weapons Instructor Course, whose primary function will be to provide graduate-level training to officers in the planning and execution of offensive and defensive cyber warfare operations. Medley was part of the CWO WIC initial cadre, graduate of the USAFWS class 12A, and is now taking command of the 32nd WPS. 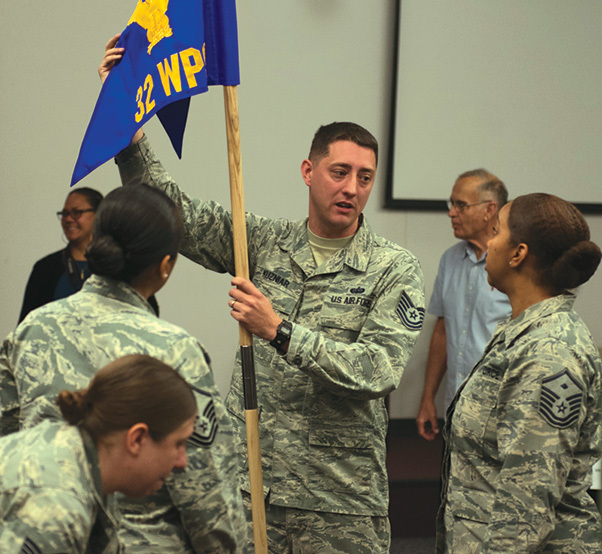 The CWO WIC has graduated more than 64 students in the last seven years and the 32nd WPS is in a unique position to lead the way in cyber warfare operations. Tech. Sgt. Kieth Kuzniar, 32nd Weapons Squadron superintendent, shows off the new squadron guidon to Master Sgt. Brandi Love, U.S. Air Force Weapons School first sergeant, during an assumption of command ceremony at Nellis Air Force Base, Nev., June 28, 2018. The 32nd WPS will focus on teaching Cyber Warfare Operations. 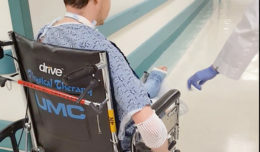 The CWO WIC supports developing leaders and cyber warriors for the Air Force and Department of Defense’s cyber mission force. Since the graduate-level program trains officers in a continuously evolving domain, the syllabus also continuously evolves. When the syllabus was first created, the cyber-only portion contained nine missions, during which students were not the hands-on operators. In the next syllabus revision, twelve of the sixteen missions are hands-on. It’s updated so frequently because the domain and how the AF operates in it is rapidly changing, said Williams. One major change in the larger AF is the contracting out of Air Force Information Technology and Infrastructure operations. When the information technology operations are contracted out, it will allow our graduates to better focus on offensive and defensive cyber warfare operations, and perhaps eventually to the point of needed WICs for each, said Medley. “The overall objective is to provide the best training that’s in sync with, or just ahead of the changes occurring in the larger joint cyber community,” said Medley. Members assigned to the 32nd Weapons Squadron gather around a table after an assumption of command ceremony at Nellis Air Force Base, Nev., June 28, 2018. 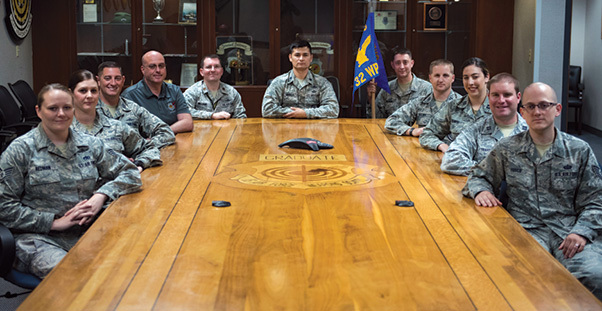 The 32nd WPS is the newest squadron in the U.S. Air Force Weapons School.